You will earn 152.30 Reward Points. Earn 1 reward point for every 1 dollar spent. Panasonic’s electric Rice Cooker is ideal for restaurants, convenience stores and vending coffee service use. Large Capacity SR-42HZP can cook up to 23 cups (4.4 qts) in approximately 30 minutes. Easy Push-Button Operation The push of a button starts the rice cooking. As soon as the rice is cooked, the unit shuts itself off. Alternate Uses Not only does it cook rice but can braise, heat liquids and cook many different items – call or see our web page for Chefs Technical Support for recipes. Easy-to-clean Removable Pan Liner The included Aluminum Alloy pan liner lifts easily out of the cooker to make washing and rinsing a breeze. An Optional “Non-Stick” pan liner is available. UL and NSF Approved SR-42HZP is built with a durability and attention to safety that has earned certification from both Underwriters Laboratories and the National Sanitation Foundation for commercial use. Direct Heating System Specially sheathed heating elements heat the pan bottom directly which minimizes heat loss and in turn saves energy costs. A thermal safety fuse will protect the unit from possible temperature rise. 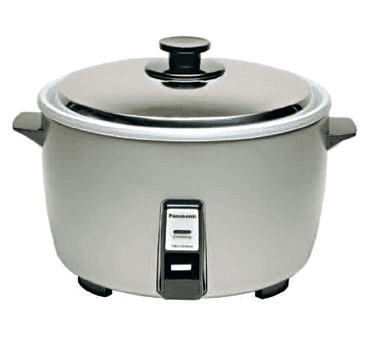 Thermostat for Precision Control The rice cooker will maintain the cooked rice warm for up to 2 hours under nominal operating conditions, virtually eliminating burning or overcooking of the rice. As a result, rice is cooked to the Chef’s preference. Master Carton Cu. Ft.: 3.51 cu. ft.
For rice that cooks just the way you want it each and every time, consider using the Panasonic SR-42HZP Commercial Rice Cooker. It uses a voltage of 120v/60/1-ph and a wattage of 1,550 watts. Arguably its best feature, this item has a capacity of 23. This rice cooker is 11.88 inches tall and 16.88 inches wide.